Panasonic's latest 58 inch UHD TV is a real treat for the eyes, though it's probably still too early to think about moving to the new 4k standard if you aren't an early adopter or in need of a new TV anyway. That said, if you do want to jump into 4K now, you'll probably find this particular TV a good, albeit expensive, investment as long as you have help unpacking it and setting it up. That's because it comes with a bizarre stand that's ultra heavy and difficult to attach, and which weighs down one end of the box - so pick the light end to lift and leave your buddy the heavy end! 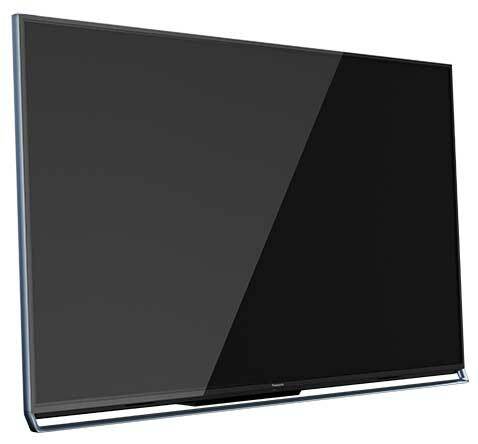 Available in 58 and 65 inch sizes, Panasonic Canada saw fit to send the smaller unit (the cads! ), which as it turned out was a really great size for my family room, where I usually have a 50 inch plasma. Setup, as mentioned, is a bit of a pain, but once you've got that out of the way the first thing you'll probably notice is that the TV slants away from you, the screen's top being farther away than the bottom. This looks weird, but I very quickly grew to like it a lot. It never failed to garner a comment from whoever came into the room, either, but there were no complaints once I fired it up, thanks to its spectacular picture. And if you don't like the TV's angle, you can always mount it on a wall. There's little UHD 4K content available yet, so keep that in mind when you shop. Netflix apparently has a couple of series in 4K, but they didn't show up as that when I scrolled through the titles. According to a couple of other reviews I checked out, this is an issue with the Panasonic, as opposed to Netflix, which if true seems like a pretty big oversight when you're pushing a high end TV such as this. Fortunately, Panasonic tossed in a USB stick with some demo content. As you might expect, the 4K picture looks terrific, even on generic demo stuff. Heck, you'd almost think this LED LCD was a plasma! The 4K treatment also worked great when up converting conventional Blu-rays or DVD's. The Panasonic up converts well, but for reasons of consistency I used OPPO Digital's BDP-103D, with which I had also reviewed an LG 4K TV recently. I remember when such "line doubling" gimmicks were a disaster, but that was long ago and technologically far away; my favorite Blu-rays looked fantastic displayed at 3840 x 2160 - double the 1920 x 1080 of today's HD standard vertically and horizontally - and though I can't wait to see them in "real" 4K, I can't imagine how much better they could look. I'm prepared to be surprised, of course. The Panasonic looks great right out of the box; I liked the THX modes the best (there's a standard one and one for use in brightly lit rooms, as well as a wide variety of other picture settings, from "vivid" to "professional") and when I ran my HD calibration disc on it, the picture was pretty well bang on already. This used to be unheard of, though it's getting a lot more common now - but regardless, it's great to see. As usual, I shut off nannies like noise reduction, high frame rate and the like, to have the signal go through the TV as pure as it could be. It paid off. When you first fire up the TV, it takes you to a home screen (which you can customize) that offered one big window on which would display the TV source as well as a series of icons and the like peppered around the screen to give access to the smart TV features. You also get a selection of apps, from the left-wing "news" site Huffington Post to Wild TV, an outdoor channel offering a variety of such programming - and lots in between. Wild horses can't get me to HuffPo, but I sampled one quick preview of Wild that showed a couple of hunters taking down a bear. To be fair, there was no context to the scene (were they using tranquilizer rounds? Were they culling a rogue bear?) - but it broke my heart to see that poor animal scramble up a tree after being shot, panicked and trying to escape, only to let go and fall to the ground after a moment, then lie there unmoving. You also get Netflix and YouTube and the like - the usual smart TV stuff, including apps that want to sell you access. There's also a Skype app, and a little camera rises out of the TV's top edge to facilitate your calls. You can also access Facebook, Twitter, weather, a world clock - and you can stream media from your networked storage or from a mobile device or computer thanks to Miracast and WiDi. Internet connection can be made via an Ethernet connection or Wi-Fi. The Panasonic also supports 3D, of course, but the company only tosses in two pairs of active shutter glasses. Fortunately, my projector also uses active glasses and they worked with the Panasonic. Unfortunately, I didn't find the 3D nearly as compelling as the passive system in the LG I tested. I'm not sure if that's the active/passive divide or one TV doing a better job - but if 3D is important to you, you can do better than this Panasonic, despite its many other great attributes. The TV comes with two remotes, a conventional one that works fine and one that has a kind of trackpad you can use for scrolling around the screen's real estate. The trackpad one is better than the bizarre, mouse-like one that came with LG 4K TV, but I hate trackpads in the first place, and therefore preferred the conventional remote - and I was glad that Panasonic chose to include it. There's also a voice control option. You get enough inputs to choke a horse, but only one of them will handle 4K, which seems kind of bizarre. It doesn't really matter right now, thanks to the dearth of 4K content, but what happens when there's plenty of it, from a variety of devices? Will you need to buy a 4K source switcher? Other inputs include three USB ports, one of which is how I accessed Panasonic's 4K demo content, and there's also a DisplayPort input that will come in handy with 4K games. I only had a PS3 to test for games, which outputs via conventional HDMI (and 1080p at best), but when I partook of some Gran Turismo 6 races, they looked fantastic. I did have some weird things happen with the Panasonic. When first set up, the TV would turn itself on and the little camera would pop up, rather bizarrely, whenever someone would walk into the room - even if they were just passing through on their way to somewhere else. It would shut itself off again after a few moments, but what a waste of electricity! Hey, I like smart devices as much as the next guy, but this was just plain strange and annoying - let alone presumptuous on the part of the TV. Not only that, but the Netflix app wouldn't work - it would start loading and just keep chugging away until I got bored and exited it. So I did a reset to the TV's original settings and all the problems solved themselves as if by magic; Netflix worked fine from then on, the camera stayed down when it should have, and the TV never turned itself on. Needless to say, I was much happier after the reset. This Panasonic was the second "smart TV" I've reviewed recently and while I have no issue with being offered extra features and content, I'd rather have a TV that's just a TV. If you want all the smart stuff - the apps, networking and the like - you can pick up a separate box that'll give you the smart TV features for a minimal investment, and that way the TV's interface doesn't have to be as complex. This, of course, isn't a rap on this Panasonic per se; it's more a state-of-the-industry whine. As for the TC-58AX800U, this is definitely an excellent television, with a truly spectacular picture (its sound is pretty good, too). It does its most important job (2D video reproduction) extremely well, with the rest of its features really being just value-added gravy to keep the TV competitive with other brands'. On the other hand, it's quite pricey and, thanks to that stand, more than a tad awkward - and you'll look long and hard to find any 4K content for the next while. And at 58 inches, I'm not sure the difference between 1080p and 4K is compelling enough to justify the added expense if you aren't shopping for a new TV already. That said, I loved this Panasonic and if I were shopping today it would definitely be right up there on my TV wish list. If you need a new TV, or just have a burning desire to have the latest technology, this Panasonic will please your eyes - and it won't be obsolete a week down the road.